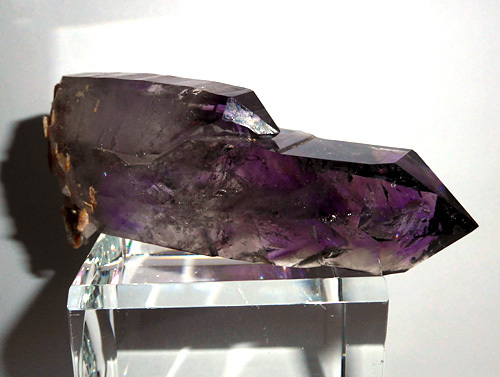 Dimensions (HxWxD): 3.25" x 1.3" x 0.75"
This one of a kind, beautiful deep purple AAA Twin Phantom Madagascar Amethyst Point, weighing 2.3 ounces or 65 grams, and measuring 3.25 inches in length, is a Lightworker's power tool and a unique mineralogical collector's item. 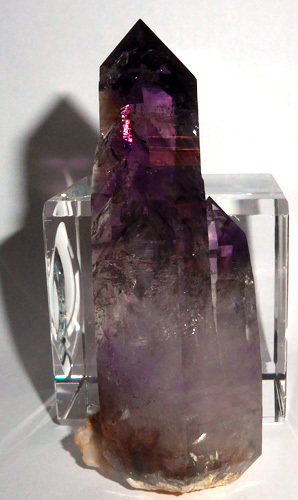 This unique AAA Twin Phantom Madagascar Amethyst Point exhibits amazing deep purple color, multiple phantoms in the main crystal shaft, a near-flawless point, and an exquisite natural finish. This AAA crystal is unpolished and untreated in any way. You can see several tiny barnacle crystals clinging to the base of the shfat on the matrix attached to the bottom of the shaft, adding to the mineralogical value of this lovely specimen. This piece is so lovely, it looks painted by the hand of the Great Mother herself! 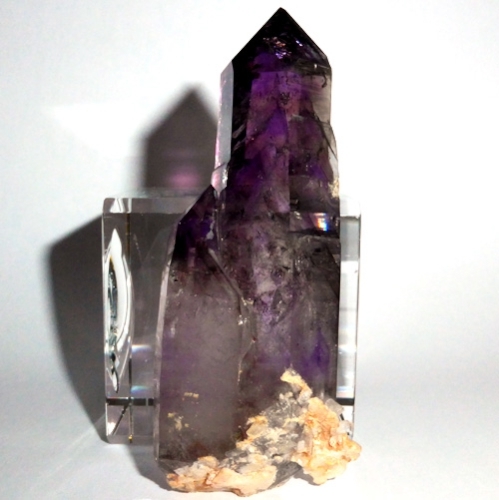 This piece emanates Deep Purple Light, and resonates strongly to the energy of the Violet Ray of St. Germain! 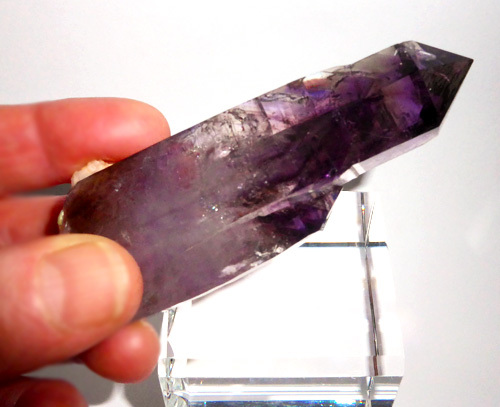 This Madagascar amethyst point is a good size to hold in your hand during meditation, and to use as a transmitter during energy healing sessions. It could certainly make lots of energy available by simply sitting upon an altar, shelf or desk during an energy treatment or meditation. Twin crystals help unite individuals and groups. 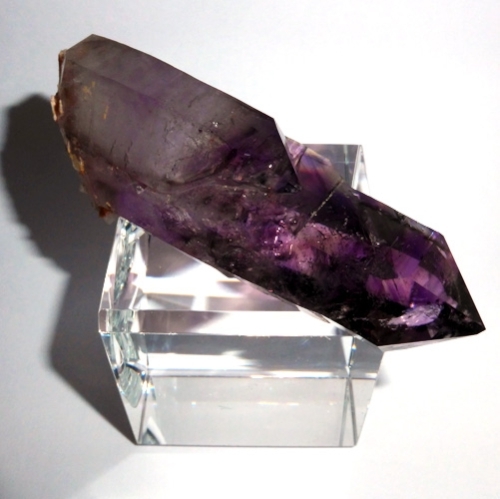 Twin crystals are said to unite our Earthly energies with energies from higher worlds, so this Twin should be a powerful tool for channeling and for development of clairvoyance and clairaudience. Barnacle crystals feature a grouping of small crystals covering all or part of the primary crystal formation, and are considered by crystal healers to be energetically similar to crystal clusters. Thus barnacle crystals, like crystal clusters, are ideal for energizing, optimizing and equilibrating relationships among groups of people -- family, friends, associates, business partners, co-workers and so forth. You can see half a dozen small barnacle crystals next to the termination tip at the bottom of the crystal in the picture below. Note: Weight above is shipping weight. Net weight is 65 grams or 2.3 ounces.